Short-time work, also called short-time compensation, is a public programme intended to preserve jobs at firms or establishments experiencing temporarily low revenues, by providing wage support to the employees the firm wishes to keep with reduced work hours. The 2008–2009 Great Recession gave OECD countries the opportunity to expand on such short-time work programmes – whereas the OECD average take-up rate was less than 0.2% in the fourth quarter of 2007, just before the Recession, it increased six-fold, to 1.3%, in the fourth quarter of 2009 (Hijzen and Venn 2011, Hizjen and Martin 2013). However, despite short-time work increasing in popularity, even in recent academic work, very little is known about its causal impact on employment. Our recent paper helps to fill this gap by taking advantage of the massive expansion of the French short-time work programme during the Great Recession (Cahunc et al. 2018). From the end of 2008, the Ministry of Labour not only expanded the policy's budget, but also wrote circulars and directives, in order to promote the use of short-time work as rapidly as possible. As a result, the share of employees on short-time work increased from 0.3%, in 2007 just before the Great Recession, to 4% in 2009, the year of programme expansion. Subsidies per non-worked hour and subsidies per employee were respectively multiplied by 1.4 and by 2.5 between these two dates. The cost of the policy trebled, multiplied by a factor of 20. By precisely analysing the programme, both in its principles and in its practical implementation, we show the extent to which, and explain why, short-time work works – both from a theoretical and an empirical perspective. On the theoretical side, we demonstrate how short-time work saves jobs when firms face a sharp drop in their revenues. We also show that firms facing a limited decrease in revenues are likely to use short-time work to reduce hours for jobs at no risk of being destroyed. In fact, short-time work is shown to be particularly helpful for credit-constrained firms which use the programme to partly finance the jobs they need to hoard during a very negative shock. Despite the potential windfall effects just mentioned for mildly hit or credit-unconstrained firms, the cost per saved job is shown to be small compared with other employment policies. In contrast to wage subsidies paid independently of hours worked, short-time work gives firms the right incentives to use subsidies for jobs at risk of being destroyed rather than other jobs, insofar as they pay a fraction of the remuneration of non-worked hours. To put it differently, because firms will select those jobs at risk of being destroyed for inclusion within short-time work programmes, low-productivity jobs that may need financial support to survive during recessions are targeted much more precisely than most other policies such as wage subsidies can do. Hence, short-time work can help in sustaining employment in recessions at a small cost. On the empirical side, we use administrative data providing remarkably detailed information about short-time work use, employment, and financial characteristics for all French establishments at an annual frequency over the period 2007–2011. To deal with the selection of firms into short-time work, we document the role of the local administration in charge of managing the policy at the local (département) level. The local administration duties comprise informing firms about the policy, the management of applications, and the payment of short-time work subsidies to firms. Their autonomy in management creates strong behavioural heterogeneity, in particular in their response time to applications, across the 95 départements of mainland France before the Great Recession. This administrative response time is shown to play a key role in the implementation of short-time work. We also document how the policy diffuses from one firm to another at the local level. Geographical proximity of short-time work users before the recession is shown to favour the use of short-time work in 2009, controlling for the response time of the administration. In particular, short-time work use diffuses in 2009 from those multi-establishment firms which used short-time work in 2008 because they were located in a département with a short response time. Hence, firm-to-firm diffusion, even though unknown in its exact details, appears to have a key role. The response time of the département before 2009 has an impact on short-time work use in 2009 of single-establishment and multi-establishment firms. Short-time work use diffuses from multi-establishment firms to the other firms. the (physical) distance of the firm to the closes mutli-establishment firm which used short-time work in 2008. These instruments allow us to demonstrate causality in the identified effects. First and foremost, short-time work has a clear positive impact on employment and the survival of firms facing the largest potential drop in their revenue, in particular when these firms are highly levered. By contrast, short-time work has no effect on employment and the survival of other firms. As a result, about half of the short-time work users in 2009 benefit from windfall effects since they received short-time work subsidies for jobs at no risk of being destroyed. Nevertheless, short-time work saved jobs overall and also limited the drop in the total number of hours worked. For every worker on short-time work, 0.2 jobs are saved and the total volume of hours increases by 10% of her usual number of hours worked. Despite the windfall effects mentioned above, the cost per saved job (i.e., the total amount of subsidy needed to save a job) by short-time work in 2009 is estimated to be equal to 7% of the average labour cost, hence very low when compared with other such employment policies. Moreover, we do not find that short-time work mainly saved jobs in structurally weak firms unable to recover after the recession. 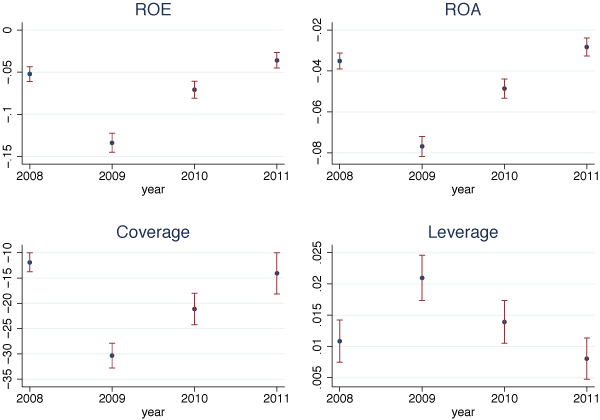 On the contrary, short-time work allowed highly levered firms, likely to face credit constraints in times of collapsing financial markets, to engage in labour hoarding and recover rapidly in the aftermath of the Recession. Sources: DADS, FARE (INSEE) and Sinapse (DGEFP). Notes: ROE: return on equity equal to EBITDA/Total Equity ROA: return on assets, equal to EBITDA/Total Assets; Coverage: EBTIDA/Interest expense; Leverage: Total debt / Total Assets; Each graph displays the difference in the value of the corresponding index between firms using short-time work in 2009 and other firms, conditional on sector and firm age. The I-bars report the 95% confidence interval. Standard errors are clustered at the sector × départementlevel. As shown by Figure 1, the profitability and the financial situation of short-time work users was much more deteriorated in 2009 than that of non-users. But it improved more rapidly for the former than for the latter, coming back to its pre-2009 level as early as 2011. These results are consistent with those of Giroud and Mueller (2017) and Caggese et al. (2018), who find that firms with weak balance sheets or facing more stringent financial constraints cut more jobs in response to negative demand shocks, but are not less profitable in the long run. This suggests that short-time work, when limited in scope and duration, is effective at saving jobs during deep recessions. Cahuc, P, F Kramarz and S Nevoux (2018), “When short-time work works,” CEPR Discussion Paper 13041. Gaggese, A, V Cunat and D Metzger (2018), “Firing the wrong workers: Financing constraints and labor misallocation”, Journal of Financial Economics, forthcoming. Giroud, X and H M Mueller (2017), “Firm leverage, consumer demand, and employment losses during the Great Recession”, Quarterly Journal of Economics: 271–316. Hijzen, A and S Martin (2013), “The role of short-time work schemes during the global financial crisis and early recovery: A cross-country analysis”, IZA Journal of Labor Policy 2: 5. Hijzen, A and D Venn (2011), “The role of short-time work schemes during the 2008-2009 recession”, Organization for Economic Cooperation and Development (OECD), Social, Employment and Migration Working Paper 115.